The chemistry of pyrimidine is a blossoming field. Numerous method for the synthesis of pyrimidine and also their diverse reactions offer enormous scope in the filed of medicinal chemistry. The utility of pyrimidines as synthon for various biologically active compounds has given impetus to these studies. The review article aims to review the work reported and the chemistry and biological activities of pyrimidines during past year. Numerous reports have appeared in the literature that highlights chemistry and uses of Pyrimidines. Of these strategies that illustrated by VI i.e. the condensation of three carbon unit with an N-C-N fragment appears to most widely use this approaches has been called the common synthesis because of its general applicability to the synthesis of a whole range of Pyrimidine derivative. The great versatility in this synthesis rests with the fact that one or both of the group of three carbon atom fragments may be present as an aldehydes, Ketone, ester or nitrile group, β- Dialdehyde, β-ketoaldehydes, β-keto esters, malonic ester, β-aldehydo or β-keto nitrile and much other combination of these groups or their masked derivatives may be used. The nitrogen containing fragment may be an amidine, urea, thiourea or guanidine and acetyl acetone serves as an excellent illustrative example in that, it readily under goes reaction with formamidine3, Guaidine4, urea5or thiourea6 to produce 4, 6 dimethyl pyrimidines. Hydantoins i.e. 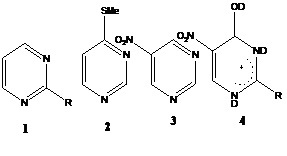 imidazole 2, 4 diones sometime arise in reactions designed to make pyrimidines. However they can usually be converted into the desired pyrimidines, often under hydrolytic conditions for example, diethyl oxaloacetate and urea under the usual conditions do not give the expected uracil carboxylic acid but the hydantoin however; this may be converted, on vigorous alkaline treatment, first in to the acyclic intermediate and thence into orotic acid. I.R. Spectra of pyrimidines: The I. R. spectra are essentially due to vibrational transition, many substitutes with single bands or isolated double bands give rise to characteristic absorption bands with in a limited frequency. Range their spectra afforded reference data for identification of pyrimidines, for the identification of certain attached groups and as an aid in studying quantitatively the tautomerism of pyrimidines, pyrimdinethiones and pyrimidines in the solid state or in non protic solvents. Naturally pyrimidin-2-one give strong absorption bands for C=O and N-H band stretching vibration more ever, it is well established that six membered hetro- aromatic ‘hydroxy’ compounds with oxygen in to a ring nitrogen give N-H stretching bands in the range 3360-3420 cm-1 while those with oxygen γ to a ring nitrogen have seen bands in the range 3415-3445 cm-1. 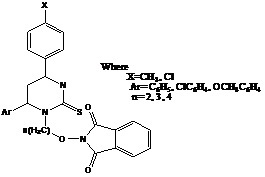 pyrimidin-2(and 4)-amine shows two 3500cm-1 representing the symmetric and anti- symmetric vibrations imines absorb at distinctly lover frequencies (3300 cm-1) . 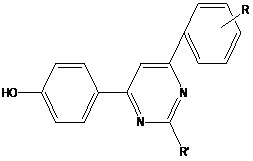 Mogilaian et al20 studied the I. R. spectra of 2- (3- phenyl- 4- formyl pyrazol- 1-yl)- 3- (4- methyoxypheyl)- 1, 8 napthopyrimidine the structure of these compounds were confirmed as the basis of spectral studies the IR spectral of these compound exhibited absorption bands at 1687 and 1608 due to C=O and C=N stretching frequencies. Alagarsamy et al21 reported the I.R. spectra of 2- Allylamino- 1, 3, 4-thiazolo (2, 3- b)- 6, 7- dimetyl thizeno- (3, 2- e) pyrimidine -5 (4H)- one exhibited absorption band at 3280, 1690 and 1180 due to N-H, C=O and C=S respecting. The I.R. spectrum of 6-[2’ hydroxyl-3’-(2”– aryl thiazol- 4” yl) -5’- substituted phenyl]-4-aryl-2-amino pyrimidines studied by Rinde et al.22 these compound show absorption bond at 2965, 2950 (-NH2) and 3040(O-H phenolic). Nuclear Magnetic resonance spectroscopy: The first proton NMR spectrum of pyrimidine appeared in 1960 and the data were confirmed subsequently. The relative deshielding of forer proton is H-2> h-4=H-5 as might be expected [S (CDCl3)] 9.26 (H- 2), 8.78 (H- 4/6), 7.46 (H- 5)] the spectrum show little change from neat liquid to dilute carbon tetrachloride solution. The three mono-c-methylpyrimidines do show long range coupling between the methyl protons and ortho or para ring protons. For example, 2-methyl pyrimidine has 0.6 Hz and 4-methylpyrimidine has 0.4 Hz (both in CDCl3). The NMR spectra of most other pyrimidines, which are mono substituted by a non tautomeric group, are unexceptional. 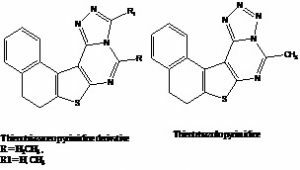 Thus 2-substitued pyrimidines show a doublet and triplet with H-4/6 broadened by coupling to the adjacent nitrogen ; the chemical shift and J4.5 naturally vary with the nature of the 2-substitutent : compare pyrimidine -2-carbonitrile(1; R= CN) [δ (Me2CO) : 9.04, H-4/6; 7.86, J4.5 5.1 Hz,H- 5] and 2-bromopyrimidine (1; R= Br) [δ (Me2CO) : 8.72, H-4/6; 7.57, J4.5 4.8 Hz, H- 5] . The NMR spectra of simple dihydropyrimidines are not easy to interpret but the spectrum of 2, 5-dihydropyrimidine (5) is particularly interesting in having J2, 5 5.5 Hz (as shown by decoupling procedure) a large value for long range coupling. Work on dihydropyrimidiene has been more popular and rewarding. for example, the spectrum of 5- cyano- 1- methyle 3, 4 dihydropyrimidine- 2 (1H)- one (6) [ δ (CDCl3) : 6.80, J4, 6 1.0 Hz, H- 6, 4.13, H-4; 3.12, NMe] clearly show the reduction of the 3,4-bond as do also those of its 3-methyl isomer and 1,3-dimethyl homologue. The NMR spectra of 6-[2’-hydroxy -3’- (2’’- arylthiazol- 4”- yl)- 5’-substituted phenyl]- 4- aryl/heteryl- 2-amino pyrimidines reported by Rindhe et al .24 Spectrum of this compound exhibited peak at [δ (DMSO- d6): 5.0(s,1H,phenolic O-H), 4.0 (s, 2H, NH2), 7.36 (s, 2H, aromatic), 7.07 (m, 4H, aromatic), 6, 90 (s, 1H, 2- pyrimidine), 7.409s, 1H, thiazole). Antimicrobial activity: Saundane et.al.26 synthesised 2- (2', 5' substituted indolideneamino- 3'- yl) - 4, 6- diaryl pyrimidines (I) and 2 [2', 5'-substitutedindole- 3'- yl) (phenyl azo) methylene imino]- 4, 6- Diaryl pyrimidine(II) with a view to screening then for their antimicrobial activity. the compound were screened for their activity at concentration 1000 µg/ml in DMF against the gram negative Bacteria E. Coli and Gram-positive bacteria S. Aureous by cup plate method and show antifungal activity against A. niger and A. flavus. Padamshali et.al.27 prepared Naptho [2, 1-b] furo [3, 2- a] pyrimidine which were useful in the preparation of pharmacologically active compound like anti-inflammatory, anti- anthelmintic, antimicrobial agents. Synthesis of 1, 2, 3, 4- tetrahydro-4- oxo- 2- thiobenzo furo [3, 2- d] (IV) pyrimidine was reported by Basavaraja et al 28 and examined for their activity against S. Aureus and E. Coli. N- (N- Alkoxy phthalimido)- 4, 6-diaryl- 5, 6 Dihydropyrimidine - 2- Thiones prepared by Talesara et.al.29 and tested against bacterial strains K. Pneumonia, E. Coli, S. Typhi, P. Aeruginosa,P. Mirabilis and fungi (500ppm) C. Albicans, A. fumigatus. Mishra et.al.30 synthesized various derivatives of pyrimidines. The fungicidal activities of the compound were evaluated against P. infestans and C. falcatum by the usual agar plate technique at 1000, 100 and 10 ppm concentration. Purohit et al 31 synthesized 5- [5'-substituted 1, 3, 4 oxadiazol- 2' yl) Dihydropyrimidinon and screened for their antimicrobial activity against S.Aureus and E.Coli using Norfloxacin as standard antifungal activity was evaluated by using A.Niger and CAalbicans using Grisofulvin as standard. Rindhe et.al.32 prepared 2-Amino-6-substituted thiazolyl pyrimidine compounds with 4-chloro and 4-methoxy substituent at four position showed significant antifungal activity. 1, 8 Napthopyridine derivatives reported by Mogilaiah et.al.33 compounds were tested for their antibacterial activity in-vitro against Escherichia coli and B. Subtilis using filter paper disc technique. Naptho [2, 1- b] furo [3, 2- d] pyrimidine were prepared by Vaidya et.al.34 the antimicrobial activity of the selected synthesized compounds was determined by cup plate method. The in-vitro antimicrobial activity was carried against 24 hr cell culture of two bacteria and two fungi. The bacterial strains used were S. Aureus and P. Aerugenosa. The fungi used were A. Niger and C. Albicans. Ming li et.al.35 synthesized 2 -cyano- 5-methyl pyrazolo [1, 5- a] pyrimidine derivatives which showed various biological activities in the terms of antibacterial, antischistosomal and xanthine oxidase inhibitor. The preliminary biological test showed that the compound exhibit activity against four fungi G. Zeave, A. Solani, P. Asparangi and C. Aracnidicola hori. Aly et al.36 synthesized a series of 1-glycosyl thio pyrimidines, annulated pyrimidines derivatives, pyrazolo [3,4-d]-pyrimidines, ditetrazolo [1,5-a,1,5’-c] pyrimidines thieno [2,3-d] pyrimidines derivative. The antimicrobial were determined in vitro using cup plate and paper disc method. 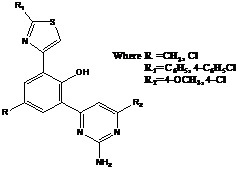 2- Thio- 5- hydroxy- 5H-  benzopyron [4, 3- d] pyrimidines derivative was reported by Karale et.al.37 ,compound were screened for their antibacterial activity against gram negative bacteria E.Coli and gram positive bacteria S. Albus using filter paper disc method. The 9 (2- Methoxyethyl) - 2, 5, 10-trimethyl- 11 (p- nitrophenyl)- 9, 11-dihydro pyrazolo [4’ 3: 5, 6] pyrano [2, 3-e] [1, 2, 4] triazolo [1, 5 -c] pyrimidines derivative was synthesized by A. H. Shamroukn et.al.38 compounds were screened for their antibacterial activity against gram-positive and gram negative bacteria and antifungal activity against A. Niger and C. Albicans. Anti-inflammatory Activity: Vega et.al39 synthesized 3- substituted derivatives of 4-phenyl- 2- thioxobenzo [4' 5] thieno [2, 3-d] pyrimidine and evaluated for their anti-inflammatory activity against carrageen induced edema in rates. They were compared with these obtained for acetyl salicylic acid, piroxicam and ibuprofen which were chosen as reference standard. Naphtho [2, 1- b] furo [3, 2- d] pyrimidine was reported by Padama shale40 et al carrageen induced rat paw edema method was employed for evaluating the anti -inflammatory activity. The compounds were given at a dose of 80 mg/kg body weight in albino rats weighing between 150 and 200 g. The edema was produced by injecting carrageenan solution at the left hind paw. Anticancer Activity: Alagarsamy et al 41 described anticancer activity of some substituted (1, 3, 4) thiadiazolo thieno[3, 2-e]pyrimidin 5(4H)-ene. The compound showed activity against Lung, Brest and other cancer. Palwinder Singh et al 42 reacted 5 benzoyl/ 5-carbaldehyde-/ 5- (3- phenyl acryloyl 0-6- hydroxy- 1H- pyrimidine- 2, 4 diones with ammines provided the corresponding enamines. The investigation for anticancer activity of molecule at 59 human tumor cell lines representing Leukemia , Melanoma and cancer of lung ,color , brain, ovary, Brest as well as kidney. Organic compounds and their complex with various ligand have found many application in biomedicine Al Allaf et.al.43 describe the preparation of R2SnCl2 complex of some 4H-pyrido[1,2-a] pyrimidin-4-one derivatives as donating ligand having multiple doner sites and examine the cytotoxic activity of some of these complex against fine tumor cell lines. Thienotetrazolo pyrimidines and thienotriazolopyrimidine derivatives prepared by Rashand et.al.44 compounds were tested as potent at anti-inflammatory agent and derivatives showed patent activity in Carrageenan test. Analgesic Activity: Rathod et al45 synthesized 2- aryl amino- 3- aryl- 5- methyl- 6- (substituted) thione [2, 3- d] pyrimidin- 4 (3H)- ones. All the synthesized compounds were screened for the analgesic activity by tail flick method an albino rats and by writing method on albino mice. 4- Amino- 5- substituted- 7- phenyl pyrido [2, 3-d] pyrimidin-2 (1H) - ones & 44- aino-5- substituted- 7- phenylpyrido [2, 3- d]-pyrimidin- 2- (1H) - thione were synthesized by shah et al 46 these compound were tested for analgesic activity. Pirisino et al47 have studied 2-phenyl pyrazolo-4-ethyl- 4, 7- dihydro [1, 5- a] pyrimidine- 7- one for it’s analgesic, antipyretic and anti-inflammatory activities the anti-inflammatory properties of synthesized compound were evaluated by carrageen an induced paw edema and cotton pellets induced granuloma method and found to posses the activity similar to indomethacin, phenylbutazone and isoxicam similarly this compound was shown to passes analgesic and antipyretic activity comparable to the former drugs. Sondhi et al 48 synthesized some mono, bi and tricyclic pyrimidine derivatives and evaluated them for analgesic activity using phenyl quinine writhing assay. 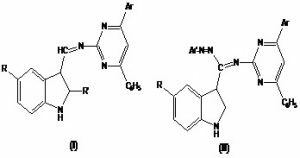 Vijay Raj et al49 synthesized some new 2-[cl- phenyl- 1H- pyrazolo [3, 4- d] pyrimidin- 4- yl) acetohydazide derivative have been prepared and screened for their analgesic activity by acetic acid induced writhing test using standard drug diclofenac sodium. Antidiabetic Activity: Desenko et al 50 synthesized azolopyrimidine derivatives and compounds were evaluated for hypoglycemic activity. 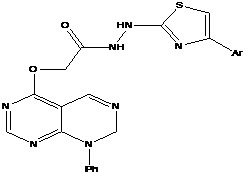 Lee et al 51 synthesized same novel pyrimidines derivative having thiazolidinedione. These compounds were evaluated for their glucose and lipid lowering activity using pioglitazone and rosigeitazone as reference compound. Miscellaneous activity: A small library of 20 tri-substituted pyrimidines was synthesized by Anu et al 52 evaluated for their in vitro anti-malarial and anti-tubercular activities. Out of the total screened compound, 16 compounds have shown in-vitro anti-malarial activity against Plasmodium falciparum in the range of 0.25-2 µg/ml and 8 compounds have shown anti-tubercular activity against Mycobacterium tuberculosis at a concentration of 12.5 µg/ml. Verma et.al.53 synthesized 2-91-piperidinye/1- pyriralidinyl0- 4-substituted phenyl -6 (3, 5- di bromo-4-hydroxy phenyl)-pyrimidines. The herbicidal activity was carried out by Cyanamid India Ltd. valsad plant valsad in collaboration with Cyana mid U. S. A. compound were tested both pre and post emergence against 18 species in an 80% acetone solution ± 0.2% in general 1 Kg activity compound at volume of 1600 lit/hec was used for this test. The minimum sample used in this test was 250 mg.
Herald et al 54 synthesis novel 4-aryl-pyrido[1,2-c] pyrimidines and compound were evaluated for antidepressant activity target compounds were tested for their affinity for 5HT1A receptor and 5-HT reuptake inhibition using radio ligand binding assay. Bernier et al 55 synthesized pyrimido [4, 5-d]pyrimidines derivative and evaluated for antidepressant activity, binding at presynaptic α-receptor site spectral data determined in solution and in the solid state allowed establishment of the relationship between activity and conformation of the molecule. Abignente et al 56 synthesized a group of imidazol [1, 2- a] pyrimidines- 2- carboxylic esters, acid and amides. All the synthesized compounds were tested in vitro for anti-inflammatory and analgesic as well as for ulcerogenic action in the rat paw edema, while almost all compounds displayed significant analgesic activity in the acetic acid writhing test. All new compounds were found to be lacking in inhibitory activity on cyclooxygenase in-vitro. Nasr et al 57 synthesized pyrido [2, 3- d] pyrimidines and pyrimido [5, 4: 5, 6] pyrido [2, 3-d] pyrimidines and investigated as antiviral agents compounds were subjected to antiviral activity testing against herpes simplex virus (HSV). 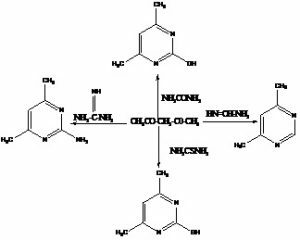 2- morpholino methyl amino-4 (4’-fuoro phenyl)- 6- (3” 4” - dimethoxy phenyl pyrimidines derivatives reported by Khan et al 58 and evaluated for anticonvulsant activity using phenyntoin as standard drug. 2-Alkyl/aryl amino methyl-4-alkyl/aryl naphtha [2, 1- b] furo [3, 2- d] pyrimidines prepared by vaidya et al 59 the activity was evaluated as earth worms pheretima posthuma by reported method. The compounds were tested at a dose of 0.001 mol/ml suspended in tween-80 piperazine citrate suspension was taken as standard. CONCLUSION: As a result of vigorous research; a vast literature has been accumulated over the years and chemistry of pyrimidines continue to be blossoming field it would also be interesting to see development of pyrimidines as potentially active therapeutic compound. Agarwal OP, Organic chemistry, Reaction and Reagent, 2006; 735. Jain MK, Sharnevas SC, organic chemistry, 2008; 3rd edition; 997-999. Hunt RR, Mcomic JFM and Sayer ER, Journal of Chemical Science, 1959; 525. Hally CAC and Maitland P, Journal of Chemistry and Science 1951; 3155. Hale WJ, J. American. Chemistry Science, 1914; 36: 104. Hunt RR, Mcomic JFM and Sayer ER, Journal of Chemistry and Science.1959; 527. Katritzky AR, and Rees CW, Comprehensive heterocyclic Chemistry (pergamom Press) 1984; 106. Behrend R, Myer H and Bucknalz O, Annular, 1901; 304, 200. Chemical Abstract, 1942; 35: 4041. Udupi RH, Pasha TY, Bhat AR, Indian Journal of Heterocyclic Chemistry, 2005; 15: 149-152. Parikh AR, Parmar JM, Indian journal of Heterocyclic Chemistry, 2001; 10: 205-208. Shah VH, Nakuen SD, Sikotra KH, Indian Journal of Heterocyclic Chemistry, 2002; 12: 37-40. Hanumantha Rao P, Ramesh VNS, Prabhakar Reddy V, Indian Journal Heterocyclic. Chem, 2006; 16: 17-20. Shwarsinh I, Rathod S, Pillai AS, Indian Journal of Heterocyclic Chem., 2000; 10: 93-96. Katritzky AR and Rees CW, Comprehensive heterocyclic Chemistry (Peragamom Press).1984; 119-121. Shamroukh AH, Zaki MEA and Morsy EMH Arch, Pharm. Chem. Life Science, 2007; 340-351. Erkin AV, Krutikov VI and Hunbralv MAC, Russian Journal of Chem, 2004; 74: 423-427. Undare AR and Veeesha Sharma PM, Indian Journal of Heterocyclic. Chemistry. 2004; 13: 275-276. Katritzky AR. and Rees CW, Comprehensive heterocyclic chem. (Peragamom pres), 1984; 65. Mogilaian K, Reddy NV and Reddy PR, Indian journal of Heterocyclic Chem, 2001; 10:267. 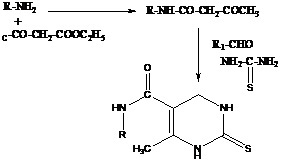 Alagasamy V, Pathak US, Meena S and Rameshu KV, Indian Journal of Heterocyclic Chem, 2003; 12: 335. Rindhe SS, Mandhare PN and Patil LR, Indian Journal of Heterocyclic Chemistry, 2005; 15,:133. Katritzky AR and Rees CW, Comprehensive heterocyclic chem. (Peragamom pres), 1984; 62 . Rindhe SS, Mandhare PN and Patil LR, Indian Journal of Heterocyclic Chemistry, 2005; 15: 133. Katritzky AR, and Rees CW, comparehensive hetrocyclic chem. (Peragamom pres), 1984; 66. Padamshari B, Vaidya VP and Vijayaya kumar ML, Indian Journal of Heterocyclic. Chem., 2002;12: 89-94. 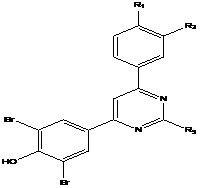 Basararaja KM, Patil VM and Agasimundin YS, Indian Journal of Heterocyclic. Chemistry, 2006; 16: 159-162. Talesara GL and Ahmed M, Indian Journal of Heterocyclic. Chemistry, 2006; 16: 109-112. Mishra A and Singh DV, Indian Journal of Heterocyclic Chemistry, 2004; 14:43-46. Purohit MN, Mayur YC and Shantakumar SM, Indian Journal of Heterocyclic. Chemistry, 2007; 16: 349-352. Rindhe SS, Mandhare PN and Patil LR, Indian Journal of Heterocyclic. Chem., 2005; 15: 133-136. Mogilaiah K and Sudhakar GR, Indian Journal of Heterocyclic Chemistry, 2003; 42B:636-640. Vaidya VP and Mathias P, Indian Journal Heterocyclic Chemistry, 2005; 14:189-192. Mining Li, Wang S and Zhang X, journal of chemical crystallography, 2005; 35:667-671. 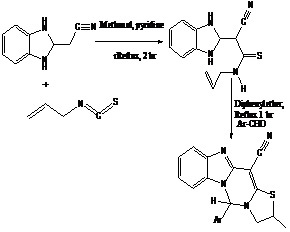 Aly and AA, Chinese Journal of chemistry 2005:23: 211-217. Karele BK and Gill CH, Indian journal of chemistry, 2002; 41B: 1957-1959. Shamrouer AH, Zaki MEA and Morsy EMH, Arch”Pharma. Chemistry Life Science, 2007; 335-345. Padmashali B, Vaidya VP and Vijaya Kumar ML,Indian journal of heterocyclic chemistry 2002;12: 89-94. Alagarsamy V, Pathak US and Revathi R,Indian journal of heterocyclic chemistry 2003 12:335-338. Talal A, Allaf KA and Redna I, Al Bayati IM and Khuzail RF, Applied orgnometallic chemistry, 1996; 10: 47-51. Rashand AE, Heikal OA and Abdul Megeig FME, Heteroatom chemistry, 2005; 16: 226-234. Singh P, Kaur J and Paul K, Indian journal of chemistry, 2008; 47B: 291-296. Talal A, Allaf KA andRedna I, applied organometallic chemistry 1996; 10: 47. Rasnad AE and Heikal OA, Hetroatom Chemistry 2005; 16: 226. Shah PR, Shah GK and Pandya PS, Indian Journal Of Pharmaceutical sciences, 1986; 48:75. Rathod IS, Pillai AS and Shirsath VS, Indian Journal of Heterocyclic Chem, 2000; 10:93. Pirisino R, Bainchini F and Banchelli G, Pharmacol. Res. Comm., 1996; 18:241. Sandhi SM, Singh N and Johar M, Bio. Org. Med. Chem., 2003; 13:6158. Vijaya Raj KK, Naryana B and Ashalatha BV, Journal of Pharmacology and Toxicology, 2006; 6:559. Desenko SM, Lipsum VV and Gorbenko NI, Journal of pharmaceutical chem. 1995; 29:265. 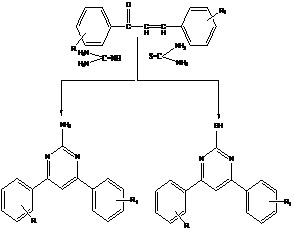 Lee HW and Kim BY, European Journal of Medicinal Chem., 2005; 4:662. Agrawal A, Srivastava K and Puri SK, Bio. Org, and Med. Chem Lett., 2005; 15:5218. Verma BL, Kothari S and Vyas R, Indan Journal of Hetrocyclic Chem., 1999; 8:285. Herold F, Chodkowski A and Izbicki L, www.Science 24.com. Bernier JL, Henichant JP and Warin V, Journal of Pharmaceutical sciences 2006; 69:1343. Abignente E, Sacchi A and Haneri S, European, Journal of med. Chem., 1994; 29:279.